Michael and I had agreed we would wake up for breakfast before going to bed following our night on the town. At 11am the next morning when we eventually managed to drag ourselves out of bed, breakfast was long over. Once I’d grabbed something to eat and left the hostel the afternoon was already upon me and I decided to head across town to the large mountainside park Mont Royal to catch a view of the city from above and chill out through my slight hangover. 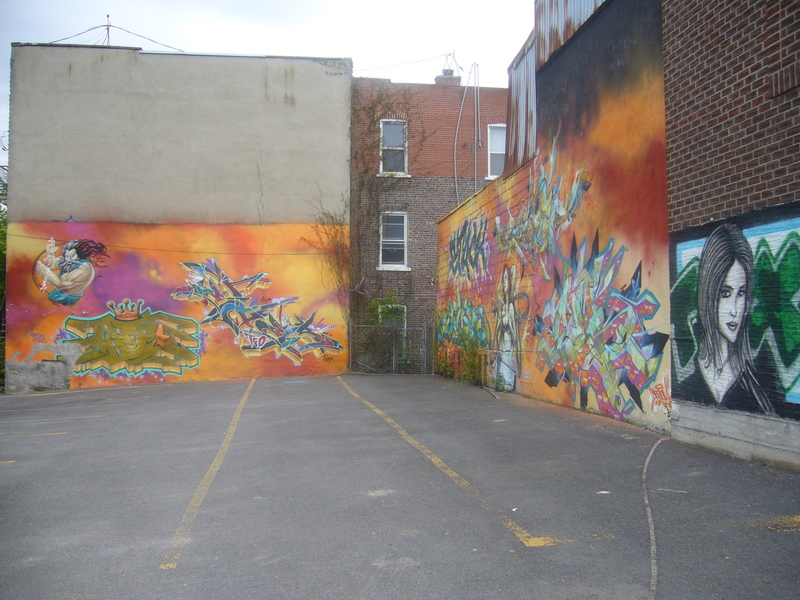 The neighbourhood around Mont Royal is super-hip, as is much of the rest of the city and there are some incredible murals on the walls of houses and businesses. The park itself is vast, I first found myself walking along next to baseball diamonds, volleyball or badminton nets and open fields covered with people enjoying the outdoors. I made my way to an empty bench and took a while out to enjoy a sandwich and a couple of chapters of my current read; The Count of Monte Cristo. I’m only about halfway through at this point, but it’s one of the most entertaining stories I’ve ever read; highly recommend it! 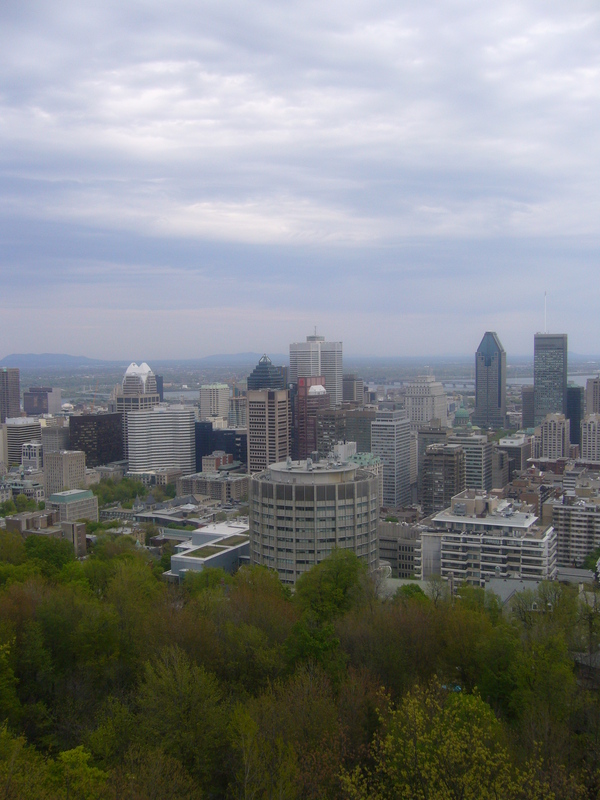 Once I’d finished eating, I headed into the forest that covers the slopes, taking a route through the trees and across rocks to find myself at Chalet du Mont Royal which offers a spectacular view across the city and surrounding suburbs. I came away from the chalet to make my way back down to the city, which ended up being a walk of several kilometres. Eventually I made it back to the hostel to find that Michael had been to see Montreal Impact play L.A. Galaxy where he witnessed a trademark Beckham free-kick. We decided to try and make up for our unhealthy binge drinking with a salad for dinner and then immediately countered the point with a bottle of wine. We enjoyed our meal with Raoul, Sam, and Nick before a few more beers and finally deciding to go to a bar for a quick and quiet drink. Things never work out as planned, and once we’d made it out for one drink, it quickly became four or five and a trip to several bars, returning to the hostel via St. Suplice for a final shared pitcher. Upon nearing the hostel, I can’t exactly remember why (for obvious reasons) Raoul decided to climb a tree, prompting Nick to attempt and subsequently fail to climb the same tree. The things you’ll do at three am after two rounds of pitchers. The following morning followed the same idea of “we’ll get up for breakfast” and then definitely not getting up for breakfast. Michael had been telling me how every Sunday in the summer people from all across the city go to Mont Royal park for Tam-Tams. I had no idea what this meant or what it could be, but I was certainly up for checking it out. 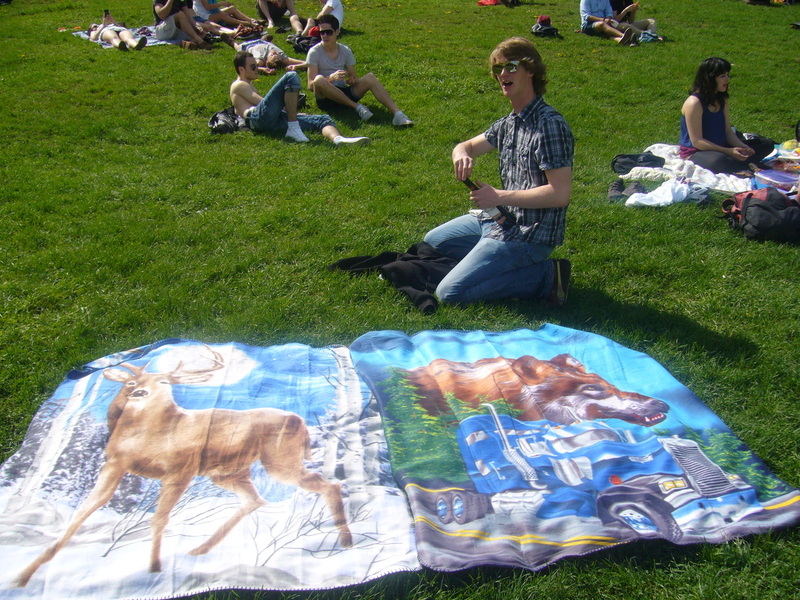 We grabbed some food from a local supermarket, picked up Matt and Fritz along the way and then purchased the ugliest blankets we could find to sit on. 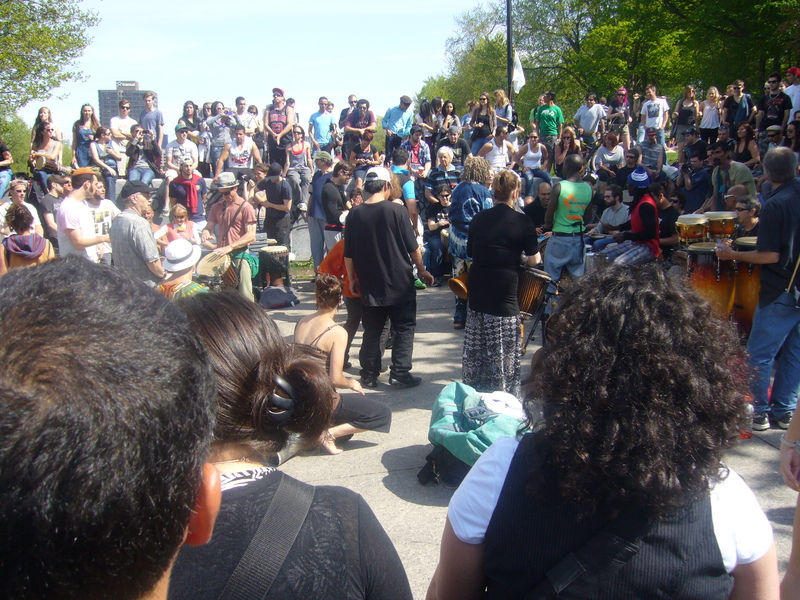 Tam-Tams is basically a large gathering of people all playing hand drums. It’s quite impressive to watch such a big group all playing their own beat and hearing the rhythm develop and evolve as new players join and people change their tempo. After watching for a while, we found a place to sit down and chill. Under normal circumstances, drinking is prohibited on the streets but for this occasion the police seem to let it slide. They’d have an awful lot of work to do if they did have a problem with it, as it seemed that half the population of Montreal were enjoying some form of alcohol. After several hours enjoying the beat, the sun and typically more booze. The four of us headed towards downtown to the Scotiabank Cinema where we hoped to catch The Avengers in UltraAVX 3D. I don’t really know what UltraAVX is or means, but based on the price I’d guess it was something between the qualities of standard cinema and the IMAX experience. Interestingly, the Canadian chain of cinema Cineplex has an agreement with Scotiabank to do with customer loyalty. Presumably there is some kind of account you can take out which offers you discounts or free showings if you use it regularly. Anyway, once we’d picked up our tickets and 3D glasses we got into the screen which was huge! The seats were pretty cool as the reclined and adjusted to your own position. The film itself was awesome, I really need to watch Captain America and Thor when I get back to the U.K.
After the cinema we went back to the hostel to have one final beer which, just like on any other occasion, turned into a few more than just one. Montreal has taken this trip to the next level. I’ve partied hard, met some excellent people and been constantly amused every time I see the Queen on the back of a twenty dollar bill and then hear the people talk in French. I’m off to Ottawa today, but I’ll definitely be back in Montreal in the future!